New pharmaceuticals for treating Type 2 diabetes – what works and how to use them. Pros and cons of inhaled insulin, insulin pumps and continuous blood sugar monitors. How to make sense out of the many new insulin analogues and insulin mixtures: which to avoid, which to use and how to use them. How to get by after the removal from the marketplace of the only long lasting human insulin. How to curb the carbohydrate craving, overeating and resultant weight gain caused by beta cell loss and resultant amylin deficit, using new amylin analogues. Debunks the exaggerated claims for new diabetes products and highlights those of value. Dr. Richard Bernstein’s groundbreaking approach to diabetes care enables you to take control of the disease by normalizing your blood sugars. Since its first publication in 1997, DR. BERNSTEIN’S DIABETES SOLUTION has become the bible for diabetics. Dr. Bernstein himself is living proof of the success of his methods. Diagnosed with diabetes at age twelve, he was a successful business executive and engineer when he worked out a way to normalize his blood sugars. This, in turn reversed many of the longterm complications he had suffered from for years. At the age of forty-five, he entered medical school in order to publish his findings and eventually treat other diabetics. In this newly revised and updated edition, Dr. Bernstein provides an accessible, detailed guide to his revolutionary approach to regulating blood sugars and outlines his methods for preventing or reversing the long-term complications of diabetes. He offers the most up-to-date information on new products, medications, and supplements. He explains the connection between obesity and Type 2 diabetes, shows how to interrupt the cycle of obesity and insulin resistance, and reveals a new method for losing weight quickly and easily. With a strong emphasis on proper diet, Dr. Bernstein tells you what foods to avoid and why. His indispensable discussion of dietary planning includes guidelines for creating a customized meal plan, complete with low-carb, high-protein gourmet recipes. Dr. Bernstein discusses the most recent breakthrough science and potential cures, including new uses of medication and exercise approaches to control weight. 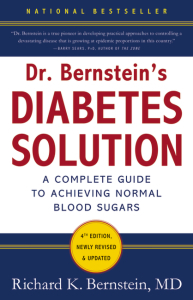 The only book to detail step-by-step methods for normalizing blood sugars in both type 1 and type 2 diabetes, DR. BERNSTEIN’S DIABETES SOLUTION will help you take charge of your diabetes and live a longer, healthier life. For other options and bundles of Dr. Bernstein’s Books, CD’s, and MP3’s visit Doctor’s Option.